Urban restaurant kitchens are renowned for being pressure cooker environments – places where long hours, short tempers, impatient customers and tyrannical chefs can combine to generate more heat than any flame on an industrial stove. This is a tale about loyalty, discipline (or the lack of it), the power of guilt, and the impact of profound moral conundrums. It is about innocence and experience, the nature of secrets, and the destruction and reconstruction of broken souls. Snider provides no easy answers to the questions he raises. There are none. But he leaves you wondering what you might do if faced with similar dilemmas. The overworked team assembled in the kitchen here includes Carlos (Dennis Garcia), the grill cook, and Miguel (Victor Marana), the prep guy, who can both shift on a dime between Spanish and English while clearly sharing a gift for putting a playful spin on work, whether by breaking into some improvised dance moods, a bit of a pop song or a racy verbal riff. 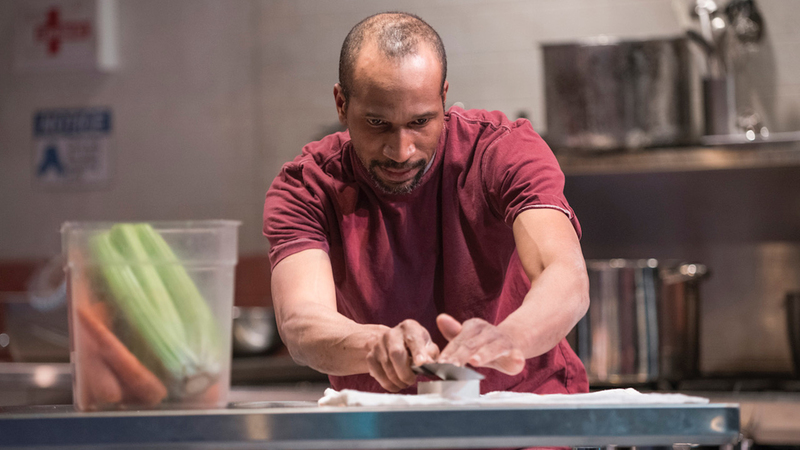 Positioned at the sink opposite them is the dishwasher, Steve (Anthony Irons), a slender man from Africa (precisely where is only explained later) who maintains almost total silence as he performs his job with an almost zen-like calm. And shuttling between the kitchen and dining areas is the young waiter, Jack (Dillon Kelleher), a wannabe writer, fresh out of college. The restaurant’s owner, Michael (Brad Woodard), is mostly off-site. Aware that his restaurant will never be a foodie paradise, he is successful enough to be able to pay the bills while enjoying a good bottle of wine and trying not to work too hard. But now, in an attempt to help out a former friend and mentor who was once at the top, hit bottom and now needs a job, he has hired George (Peter DeFaria), a formerly highly regarded chef, to take over in the kitchen and maybe raise the level a notch or two. “Chef George” is tempestuous, to say the least, and approaches his job like a drill sergeant for the Marines. Carlos and Miguel more or less roll their eyes and roll with the punches, while Jack is ruthlessly harassed and Steve says absolutely nothing. Nobody wants to lose their job. And then Steve finally does speak. He recognizes something of himself in George and teaches him a technique for controlling his outbursts. George returns the favor by teaching him the skills of a top chef. As it turns out, both men have quite shocking backstories – which should not be revealed here. Snider is a whip-smart writer whose dialogue ideally captures the radically different rhythms, inflections, humor and pain of his characters. And under the sensational, high-wired direction of Sandy Shinner, the actors turn in blistering performances, all the while finessing their kitchen and serving tasks with the ease and speed of veteran restaurant workers. The terrific interplay between Garcia and Marana is smile-inducing. Kelleher’s naïveté and ultimate anger are just right. And DeFaria is terrifying in his volcanic rages. But it is Irons, an actor of laser-like focus and subtle but meticulous emotional shading, who casts a spell over the play. He has crawled so fully into his character that it is impossible to take your eyes off him. Among its several honors, “How to Use a Knife” was named a finalist for a PEN Center USA Literary Award. Based on this exceptional Shattered Globe production alone, it should have won the prize. “How to Use a Knife” runs through June 9 in a Shattered Globe Theatre production at Theater Wit, 1229 W. Belmont Ave. For tickets ($15-$35) call (773) 975-8150 or visit www.shatteredglobe.org. Running time: One hour and 40 minutes with no intermission.